GM CEO Mary Barra briefing journalists at the 2014 annual meeting. DETROIT (Reuters) -- An investor group demand that General Motors give back more of its $25 billion cash hoard confronts CEO Mary Barra with a challenge to her plans for building the company and rewarding shareholders. 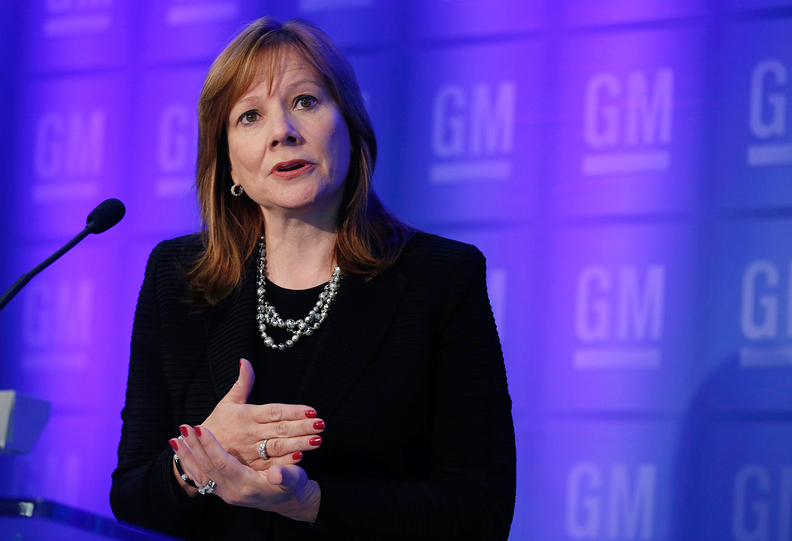 Barra and GM CFO Chuck Stevens have signaled they will recommend returning more of the cash once the Detroit automaker knows how much it will have to spend to resolve legal issues related to the company's recalls of millions of cars equipped with defective ignition switches. That includes a U.S. Justice Department criminal investigation. Several shareholders contacted by Reuters said they agree with former U.S. auto task force member Harry Wilson and his hedge fund partners that GM has more cash than it needs. GM exited bankruptcy in 2009 with little debt, and has since profited as demand for cars and trucks in the U.S. has roared back from the 2008-2009 recession. "Having a very, very strong balance sheet is wise, but we're beyond wisdom and into excess capital," said Grant Taber, portfolio manager at Westwood Management in Dallas, which owns GM shares. Wilson and a group of hedge funds are pressing GM to buy back $8 billion in stock over the 12 months following its June annual meeting, and agree to give Wilson and possibly other shareholders seats on its board. The group includes David Tepper's Appaloosa Management and three other hedge funds: Taconic Capital Advisors, Hayman Capital Management and HG Vora Capital Management, which together own about 31.2 million shares, or 1.9 percent of GM stock. GM told Reuters on Thursday it has turned to Morgan Stanley and Goldman Sachs Group Inc. to give advice on how to respond to the demands of Wilson's group. The company hasn't discussed its position regarding Wilson's proposals since revealing them on Tuesday. It said then that its goal was maximizing shareholder value through both boosting its share price and returning cash via dividends and share buybacks. A spokesman for The Vanguard Group Inc., GM's fourth largest shareholder with a stake of 4 percent as of last September, declined to comment. A spokeswoman for Harris Associates LP, GM's second largest shareholder with a stake of almost 4.8 percent as of the end of last year, didn't respond to a request for comment, while a spokeswoman for State Street Global Advisors, GM's fifth largest shareholder with a stake of 3.5 percent as of last September, declined to comment. A spokeswoman for the largest shareholder, a UAW health care trust for retired workers, had no comment on Wilson's proposal. Brock Capital Group LLC, a fiduciary that manages the trust’s GM shares, also declined to comment. GM shares are up 6.9 percent in the past 12 months, compared with a 14.8 percent rise by the benchmark Standard & Poor's 500 Index. Some investors and analysts say GM could defuse the challenge from Wilson and his backers by offering shareholders a smaller sum -- possibly $4 billion -- or spread a larger payout over a longer time. A bigger payoff can't come soon enough for some investors, however. "Sitting around with $25 billion in your pocket getting zero percent on it just doesn't make any sense to me," said Gary Bradshaw, portfolio manager with Hodges Capital in Dallas, which bought GM stock on the same day it said it would hike its dividend. He supports adding Wilson to the GM board. The yield on the benchmark 10-year U.S. Treasury bond is currently just under two percent. Scott Schermerhorn, managing principal with Granite Investment Advisors in Concord, New Hampshire, which has GM as one of its largest holdings, called talk of not returning more money to shareholders a "looney tune." "That is our money and if they really don't have a good use for it, it should be coming back to us," he said, adding he was open to adding Wilson to the GM board. GM does have plans for a good chunk of its cash. In addition to recall-related litigation costs, Stevens last month laid out other calls on the automaker's cash in 2015, including $9 billion in capital spending, about $2 billion for dividends, $1 billion for restructuring and an estimated $1.2 billion of remaining recall costs. Some investors said GM's cash generation is strong enough to meet its obligations and make shareholders happy. "What matters is that the stock is cheap and you can create a ton of value by using excess capital that's available right now," said Michael Kon, senior analyst with Golub Group, which owns GM shares in its equity mutual fund. Kon declined to say how his firm would vote on Wilson's proposals, but called his plans a positive development. John Smith, a former group vice president at GM who ran global product planning, has little sympathy for those who want GM to sacrifice a chunk of its cash. "You can almost not have enough cash," he said. "GM had run out of money by the time it got to the second half of '08 so who would want to repeat that?"